Following a long relationship and the implementation of several successful projects, Principle were tasked with transforming several floors of Atkins' Euston Towers offices in order to develop an inspiring workplace that would lead to improved productivity. Our workplace and interiors specialists turned the initial concept into visual plans and, in consultation with the client, produced a final design that helped to develop a new way of working into the Atkins culture. Among the major changes was the creation of additional collaboration and team building project spaces to encourage a more relaxed environment, smarter workstations and additional breakout areas. Principle carefully selected and sourced a range of ofﬁce furniture from a number of high-quality suppliers, including the manufacture of bespoke elements to ensure there were no compromises from the design. Colour was another important part of the ofﬁce refurbishment and, to reﬂect the professional nature of the business, a calming scheme of whites, greys and blacks was chosen for the main working areas of the building. 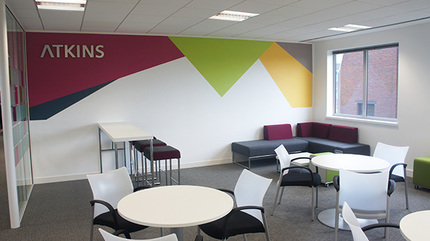 However, to promote a more relaxed atmosphere, the Atkins corporate colours were used to brighten the lockers, soft furnishings and carpets. The ﬁnal design was implemented in a seamless ofﬁce ﬁt-out, with the work concluded on time, within budget and to the full satisfaction of the client.